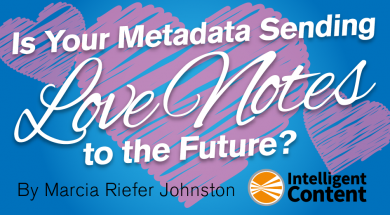 Is Your Metadata Sending Love Notes to the Future? Have you ever thrown something away that you would give anything to have back? I did just that when I moved to Portland a few years ago. I threw away a newspaper article shellacked onto a thin piece of wood. For most of my life, it had hung on a wall in my grandparents’ home in Canton, Ohio. It had become mine. I let it get away. 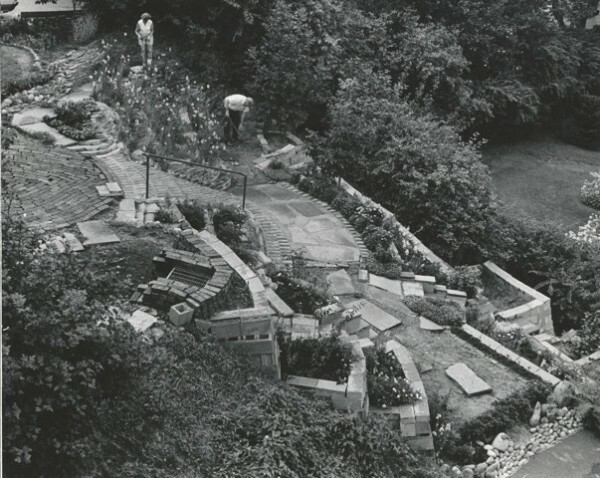 The article featured a photo of my grandparents, Clara Louise Riefer and Donald Elmer Riefer, working the slope of their backyard garden. The photo catches them in the middle of transforming a jungle of weeds into the magical place that it would remain in the family’s collective memory long after the next tenants allowed it to return to a jungle of weeds. The photo hints at the garden that would become the backdrop to many a Football Hall of Fame Parade party. The photo foreshadows the terraced fairyland of flowering sedums, snapdragons, and peonies that my children and my sister’s children – now all grown – explored from the time their legs could take them up and down the brick steps. As you see, I still have the photo. As for the article that went with it, I remember that it told of a married couple who took up gardening to fill what the journalist called a “void” created when their two sons, one of them my father, moved away. I remember the phrase “void in their lives” from the headline. The article went on to tell … who knows what it went on to tell? I don’t know why I threw this heirloom away. No one else in the family has a copy of the article. I tell myself that the shellac had grown so dark that the words were barely legible. I tell myself that it’s healthy to let go of the past. I tell myself that since I have the photo, I don’t need the write-up. But sometimes I long for the lost story. I wish I could conjure the details that the journalist thought worthy of capture – the quotations, the observations, the sentences and paragraphs that some publisher found moving enough to publish and that some family member found moving enough to immortalize in shellac – details that probably molder in a newspaper’s basement, buried in a box or in a drawerful of microfiche. Details beyond the reach of Google. I once called the Canton Repository. I told them that the headline contained “void in their lives.” I gauged the date at somewhere in the late 1960s. They couldn’t help me. What does my nostalgic story have to do with metadata? Sadly, nothing. That newspaper article was never associated with any metadata – at least not any metadata that can lead me, today, to what I’m looking for. Mid-20th-century newspapers couldn’t be expected to create that kind of love note. Today’s content producers know better. 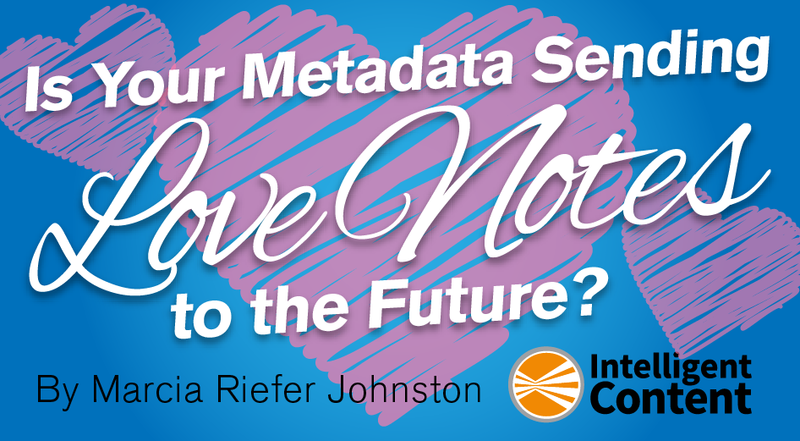 Yet, creating metadata can feel more like an act of drudgery than a declaration of love. For example, I work with a team that produces white papers for a large high-tech company. This last year, I’ve been the only one providing the client with the metadata for those white papers – not because I’m the best person for the job but because no one else wanted to do it. When each white paper is completed, I fill in an eight-page form, supplying various kinds of metadata that will be associated with that white paper when the client uploads it to the web. Do those sound like declarations of love to you? Let’s back up and review what metadata is. This section, unless otherwise noted, represents my interpretation of the descriptions in Ann Rockley and Charles Cooper’s book Managing Enterprise Content: A Unified Content Strategy, 2nd ed. (Berkeley: New Riders, 2012), especially the section called “What Is Metadata” starting on Page 184. At Ann’s request, I have changed the original phrase unified content to intelligent content. Metadata is information that enables computers – and, by extension, people – to find the information they need. It’s the stuff that makes intelligent content intelligent. It’s more than just data about data; it’s the encoded knowledge of your organization. Metadata can describe the behavior, processes, rules, and structure of data. And it can add whatever other kinds of description people want to add. Well-designed metadata classifies and identifies elements of content, enabling computers to find those elements of content and process them in ways that support an organization’s goals and meet its customers’ needs. Everyone working with a set of content must use metadata consistently. When metadata is missing or poorly implemented (garbage in), computers generate incomplete or incorrect information products (garbage out), and people slap their screens in frustration because they can’t find what they’re looking for. Misidentified content (content with poor metadata) may become inaccessible. Unidentified content (content with no metadata) can lead to costly problems. In 1999, for example, a lack of metadata led to the spectacular destruction of NASA’s Mars Climate Orbiter. The spacecraft’s thrust was miscalculated because one team’s software treated certain numbers as pound-seconds while another team’s software treated those same numbers as newton-seconds. No metadata identified these units of measure. The spacecraft, which disintegrated when it got too close to Mars, cost NASA over $300 million (as described in David Marco’s book Building and Managing the Meta Data Repository, 2000). An organization can take advantage of the power of metadata only when everyone on the content team tags information in the same way, enabling people to build on their shared knowledge and find information when they need it. For example, content creators can find elements of content and then reuse them rather than rewriting them – or rather than copying and pasting them. Descriptive (publication) metadata helps customers find published content. Since metadata determines the success of any intelligent content strategy – enabling computers to efficiently find, track, assemble, and reuse content efficiently – organizations must design metadata with care. Determine scope, focus, and purpose. Design the description form and the implementation. Create and evaluate the descriptions. Metadata is often designed by corporate librarians, information architects, or taxonomists – people who specialize in creating classification schemes. It takes a specialized skill set, and a specialized mindset, to design metadata that supports the goals of an organization and the needs of its customers. Unlike newspaper owners and journalists of my grandparents’ generation, today’s content providers must tag their content with good metadata – relevant, electronic information about information – to make that content findable. Findability alone doesn’t make content intelligent, but content can’t be intelligent without it. When a content team uses metadata in consistent ways that support business goals and customer needs, that organization piles up the love notes. Customers and employees alike feel the love for years to come. Don’t expect any glory, though, for creating good metadata. Relevant, useful metadata doesn’t call attention to itself. It just makes things work. It gets no byline. No one “likes” it, tweets about it, comments on it, or shares it on Facebook. Few people even know it’s there. It spends its days silently waiting for that special someone to come along and receive its message: Whoever you are, whenever you come looking for me, I love you, I love you, I love you. How about your metadata? How is it sending love notes to the future? Tell us in a love note of your own in the comments below. What favorite resources on metadata can you recommend? Let us know in a comment.